Hennessey Performance is looking to hold onto its claim to fame as the builder of the world’s fastest production car. The Texas-based company, which set an unofficial 270 mph mark with its $1.2 million Venom GT, has confirmed production and of its next supercar: the Venom F5. That’s F5 as in the Fujita scale, which measures the wind speeds of tornados and covers a range of 261 mph to 318 mph. The first number is particularly significant, as it is the electronically-limited top speed of the $2.5 million Bugatti Chiron, which is the fastest new car in the world today. Bugatti says the 1,500 hp coupe is capable of much higher speeds, but has yet to prove it by making a run with the limiter disengaged. Along with teaser images of the production Venom F5, which first debuted in renderings back in 2014, Hennessey also announced the establishment of Hennessey Specialty Vehicles, a new division set up to build the car in Sealy, Texas. Although it hasn’t revealed the specifications for the Venom F5, Hennessey predicts that it will get close to 300 mph, if not break it. The Venom GT featured a 1,244 hp 7.0-liter twin-turbocharged V8, and was based on the lightweight chassis of a Lotus Exige. Along with achieving the 270 mph top speed, the Venom GT earned a Guinness record for the fastest 0-300 kmh sprint, which it did in 13.63 seconds. 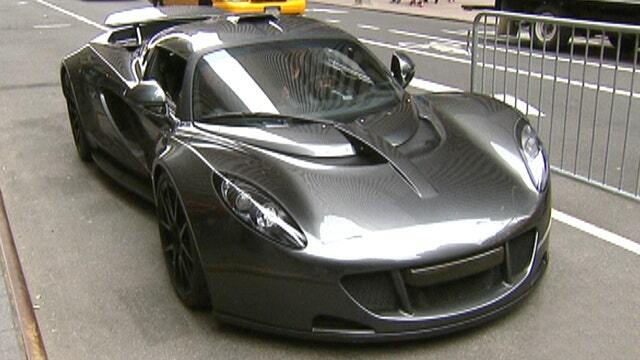 Hennessey sold just 13 Venom GTs, split between coupes and open top spiders. Instead of working with an existing car this time around, Hennessey says it is designing and engineering its chassis from scratch. A pair of nostril-like intakes near the bottom of the windshield is one update from the original renderings that can be seen in the teasers. The Chiron’s predecessor, the 1,200 hp Bugatti Veyron Super Sport currently holds the official top speed record at 268 mph, which was the average of two runs in different directions, as per Guinness rules, and set at an ultrafast test track owned by Bugatti parent company Volkswagen in Germany that Hennessey and others do not have access to. The Venom GT’s record was a one-way trip down the Kennedy Space Center’s old 3.2-mile-long Space Shuttle landing runway, while the VW track has a high speed oval that’s 12 miles around with a straight that’s over five miles long. The price and start of production date for the Venom F5 have not been announced, but a full reveal of the car is coming later this year.